UPDATE: Race is now starting and finishing inside the park! See the course map below for details. Parking is very limited. Be green! Remember MARTA is smarta. 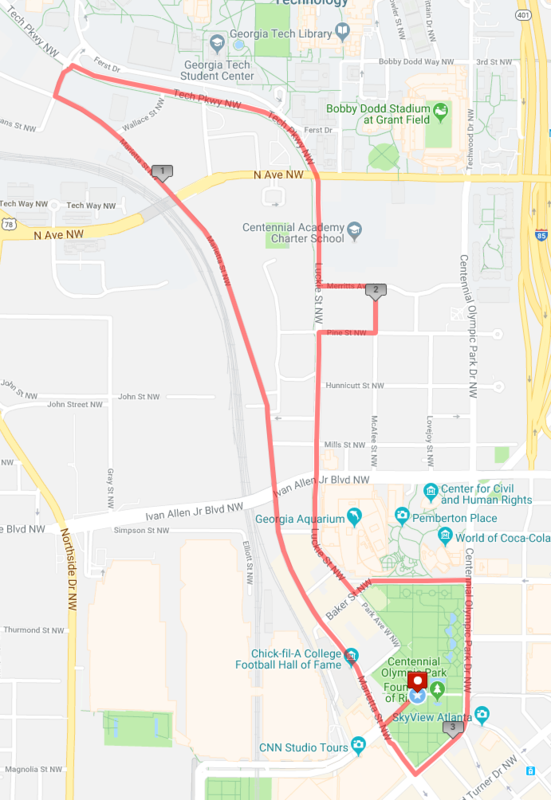 Simply take the West Line to the Philips Arena/Dome/GWCC Station (W-1), or take the North Line to Peachtree Center (N-1), and follow the signs to Centennial Olympic Park. There is NO BAG CHECK or holding location for personal items during the race, please make other arrangements as needed. Please note for the safety of all guests, and per Centennial Olympic Park security policy, only clear bags smaller than 17″ x 13″ x 9″ will be permitted inside of the festival. All bags are subject to be searched. Exceptions will be made for medical or nursing necessary bags, but will still be subject to inspection. Hydration packs are permitted for the 5k race only. Please make note and pack accordingly, no storage will be available on-site for prohibited items. In purchasing this road race bib, I agree and know that running a road race is potentially hazardous activity, which could cause injury or death. I will not enter and participate unless I am medically able and properly trained, and by my purchase or agreement to participate, I certify that I am medically able to perform this event, and am in good health, and I am properly trained. I agree to abide by any decision of a race official relative to any aspect of my participation in this event, including the right of any official to deny or suspend my participation for any reason whatsoever. I attest that I have read the rules of the race and agree to abide by them. I assume all risks associated with running in this event, including but not limited to: falls, contact with other participants, the effects of the weather, including high heat and/or humidity, traffic and the conditions of the road, all such risks being known and appreciated by me. I understand that bicycles, skateboards, baby joggers, roller skates or roller blades, animals, and personal music players are not allowed in the race and I will abide by all race rules. Having read this waiver and knowing these facts and inconsideration of your accepting my entry, I, for myself and anyone entitled to act on my behalf, waive and release the Sweetwater 420 Fest 5K, Happy Ending Productions, HEP Event LLC, SweetWater Brewery, the City of Atlanta, all event sponsors, road race management company, event volunteers, their representatives and successors from all claims or liabilities of any kind arising out of my participation in this event, even though that liability may arise out of negligence or carelessness on the part of the persons named in this waiver. I grant permission to all of the foregoing to use my photographs, motion pictures, recordings or any other record of this event for any legitimate purpose. *No refunds, no transfers.